As expected, Adobe has announced Photoshop Elements 7. I say as expected, because for the last few cycles, they announce an upgrade in early September with availability in October or so. I have been beta testing PSE 7 since last February. I could tell by the beta testing activity that the testing cycle was nearing completion. I have also been participating on the beta test team for Premiere Elements 7, Adobe’s consumer video editing program, for the past several months. Adobe has chosen to skip the version numbers 5 & 6 for Premiere Elements to avoid the confusion that has bothered consumers. Now, both products will have their versions numbers in sync. I found out about the announcement from a friend’s email that referenced an article in PC Magazine. There is also an announcement at DPReview.com. Adobe also has a link to Photoshop Elements 7. In addition, to bringing out the new versions of these programs, Adobe has been featuring Photoshop Express Beta for the past several months. When Photoshop Elements 7 hits the stores, Photoshop Express will lose its beta designation and go prime time. One of the new main features of Photoshop Elements 7 will be its tight integration with Photoshop Express. I have been playing with Photoshop Express Beta. Linking it directly to Photoshop Elements should be popular to many users. In the coming weeks, I will have more to say about all three new offerings from Adobe. I’ll wait until more details come out in the press or am officially released from the non-disclosure agreement I signed. I can offer this somewhat obvious advice. If you were about to go out and buy PSE 6 or PRE 4, I would wait a bit longer. At the other end of the continuum, if you already have PSE 6 and/or PRE 4, I would not panic. Your programs are not obsolete. Well, again there has been some time since my last post. I have been working on updating my class handouts for the fall term. I am looking forward to the start of classes. Both schools now will be using PSE 6. Last year the South Bay Adult School was using PSE 6, but the Torrance Adult Center was still using PSE 4. It is going to make things easier for me, plus I hope better for the students. My handouts have been a mixture of PSE 6 and earlier versions depending upon the topic. There will still be some differences in the content between the two schools, SBAS will be getting new Vista PCs with DVD burners. This opens up the potential for new classes, as well as additional topics in my current courses. As I was working on my updates, I came across a change between PSE 6 and earlier versions in how the Feather command treats the edge of your image. Adobe has added the Refine Edge command in PSE 6 and CS3 (Professional Photoshop). When they this they also changed how the Select > Feather command works. In previous versions of PSE, there was no feathering done at the edge of the selection that was created by the edge of the image itself. In PSE 6, this not the case. 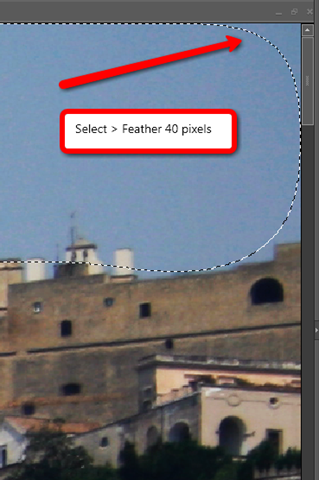 See the figure below which shows the result of feathering a selection by 40 pixels in PSE 6. In earlier version of PSE, the marching ants or dotted lines would go along the edge of the image and not round the corners as shown. 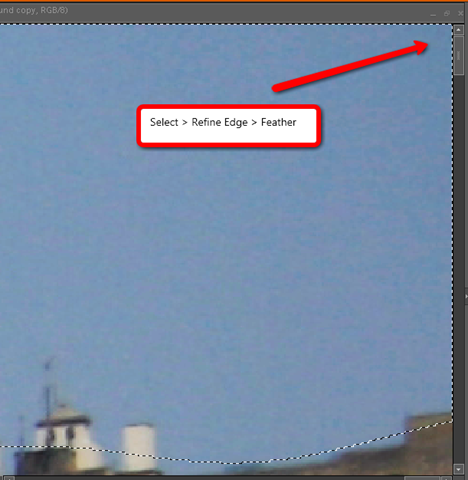 Using the PSE 6 Refine Edges command the feathering along the edge of the image is the same as older versions of PSE. This is shown in the figure below. You may not notice this difference with small values of feathering, but with larger values you introduce the appearance of vignetting if you say darken the sky. There is a lot more to using the Refine Edge command, and it can be very useful in improving your selections. I will be exploring this command in one of my class exercises. By the way, I learned about this difference from a recent issue of the British magazine, “Digital Photo”. Close the dialog box without making any changes. Now as with the basic duplicate layer technique you can fine tune the effect by adjusting the Layer Opacity. Occasionally, what I will do in addition is go back into the Levels Adjustment Layer and make some adjustments using the sliders. Are the results using this modified technique better than just changing the mode of the duplicate layer? I would be interested in your comments on this and other techniques you use to give your images that added impact.